The Brooklyn Three Kings Day Parade postponed its 21st annual celebration in Williamsburg due to weather conditions. 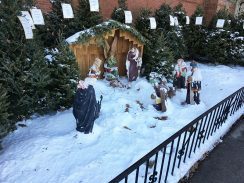 The traditional celebration that features live camels and farm animals in the line of march usually takes place on the feast of the Epiphany, but Williamsburg District Leader and Community Board Member Tommy Torres posted on the event’s Facebook page that it was rescheduled to Sunday, Jan. 21. 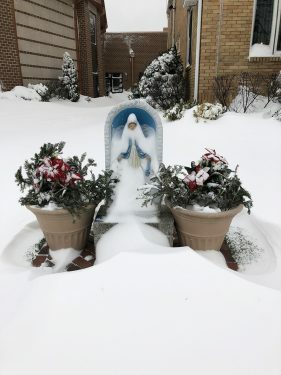 The winter storm not only closed diocesan offices on Thursday and Friday, Jan. 4 and 5, but also postponed nearly a dozen events organized by the Office of Faith Formation, according to the diocesan director of Faith Formation, Theodore Musco. Classes for the diocese’s Secretariat for Evangelization and Catechesis program that were postponed included the ‘Planning for Renewed Efforts in Youth Ministry’ and ‘Evangelizing Youth and Families’ originally scheduled for Jan. 6 at the Immaculate Conception Center, Douglaston. Youth minister Sister Heidi Delgadillo, P.C.M., was informed by phone that the class she was going to take for her ministry at the Co-Cathedral of St. Joseph in Prospect Heights was moved to a different date. It turned out the changes worked better for her hectic schedule. She said the training classes provide resources that help improve and develop her parish’s youth ministry. For those who registered for one of the events that were rescheduled, Musco stated that an email will be sent with further updates or they can check on the diocesan website. Msgr. 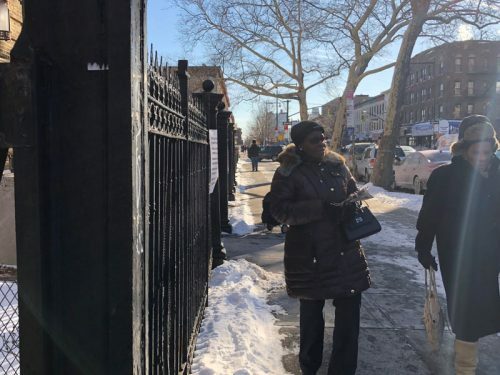 Guy Massie of Sacred Hearts-St. Stephen parish, Carroll Gardens, was just one of the pastors who confirmed that Mass attendance was down because of the inclement weather. He said the numbers were pretty low on Saturday evening and at the 8 a.m. on Sunday, but more people started showing up for the 10 a.m. and 12 p.m. Masses. As far as he could tell, the storm did not damage parish property in any significant way. “We got through,” he said. He was even able to walk across the footbridge above the Brooklyn-Queens Expressway just as the snow stopped falling. Despite the harsh winter conditions, he said, traffic kept on moving below. 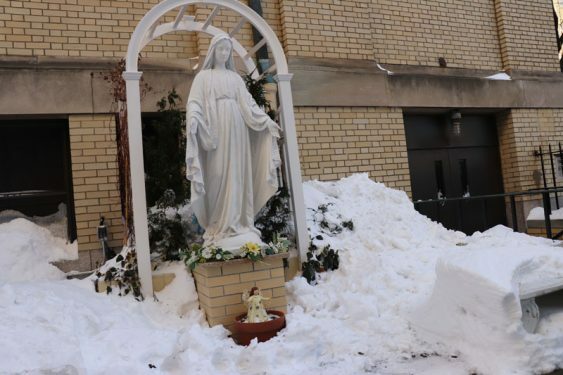 Father Kevin McBrien, the pastor of the eastern-most parish in the diocese, Our Lady of the Snows, North Floral Park, said the winds were so severe he could not see across the street to read the signs of the shops. The snow was blowing vertically, obscuring vision. He was concerned for the safety of the children attending Our Lady of the Snows Catholic Academy. 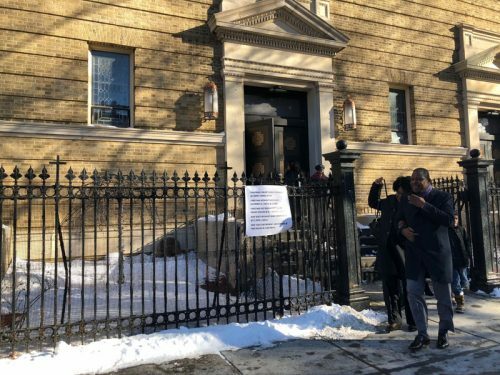 He kept in touch with the principal, Joseph Venticinque, throughout the day on Thursday, Jan. 4, and together they finally decided to keep the school closed on Friday. 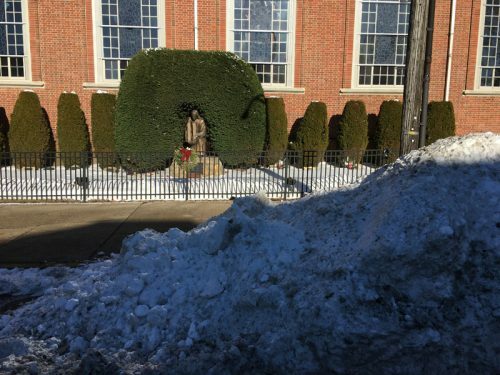 Father McBrien said the task of shoveling all the necessary snow to open the school would have created an extraordinary hardship. However, he was more concerned with children going out in such cold conditions. 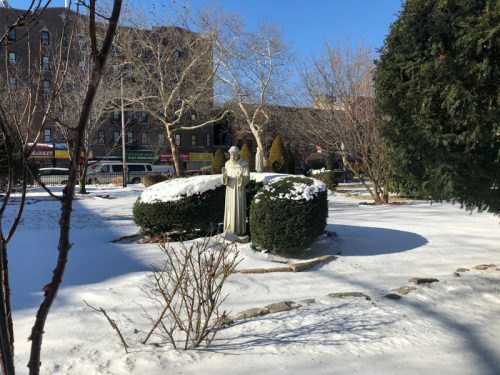 The school, along with every other Catholic academy and school in Brooklyn and Queens, was able to resume classes as normal on Monday, Jan. 8. 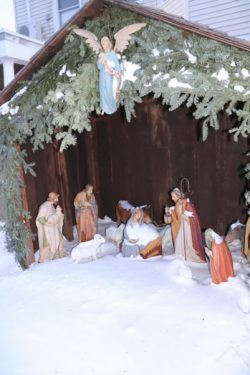 Despite the frigid temperatures, the parish did not give up its Epiphany celebration. A special concert featuring the parish musicians, including the bell, children’s, adult, Filipino and Indian choirs, warmed the hearts of parishioners. In lieu of an admission charge, attendees were asked to donate a new or gently used men’s coats for distribution to the needy. Breezy Point pastor, Father Peter Rayder of Blessed Trinity parish said that the seaside parish was hit hard by the storm. Down the peninsula, the pastor of St. Camillus, Rockaway, Father Richard Ahlemeyer, exclaimed, “Wow! We got hit hard. Attendance was down but I was expecting that. “Our parking lot was open and clear but many people couldn’t get their own cars out, so they couldn’t get here. Msgr. 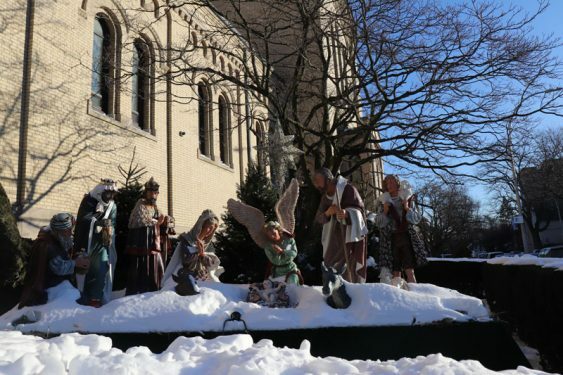 John Maloney, pastor at St. Anselm, Bay Ridge, was faced with a troublesome heating system to complicate his weekend. “One of our boilers went and we didn’t have heat during the weekend,” he said. “It is still being worked on but it mostly has come back on now. School was closed both days; it just wasn’t safe for them to be out in that freezing cold. Paths were shoveled but in those conditions there was only so much we could do. 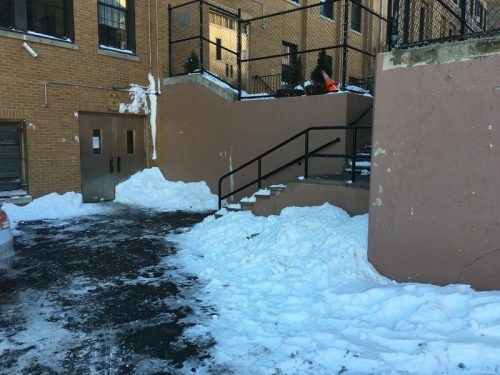 Father Robert Adamo, pastor of St. Ephrem, Dyker Heights, said, “School was definitely closed both days. The snow plus the bitter cold and the conditions were just too much. More than half of our regular attendance at Mass couldn’t make it, whether it was they couldn’t get their cars out or it was just unsafe for them to be out and traveling. In Douglaston, Msgr. 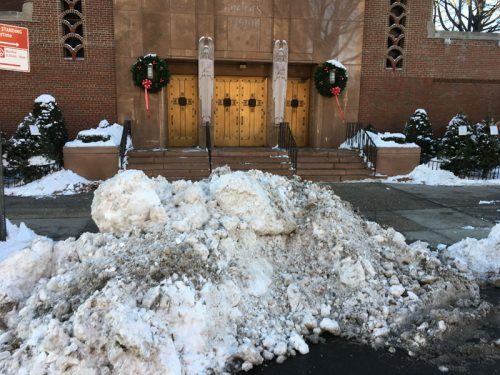 Anthony Sherman, pastor of St. Anastasia, Douglaston, reported, “Of course numbers were down for Mass but that weather can be deadly. We don’t have much staff so we were a little overwhelmed with all the work that needed to be done. We haven’t found any damage to the property yet so fingers crossed. Contributing to this story were Melissa Enaje, Matthew O’Connor and Antonina Zielinska.